The date is set for the 12th Annual Billy Kimmel Memorial Golf Tournament. This year’s event will be held on Thursday, May 16th, with a shotgun start at 9:00 a.m. Registration will be from 7:45 a.m. to 9:00 a.m. Entry fees for this year - $70/golfer, $280/team. The final cut-off date for all registration is May 3rd. Each team will receive a deli-style lunch during the outing, as well as a hot dinner at the finish of the tournament. Also, there will be a number of door prizes that each participant is eligible to win, including golf equipment, golf apparel, race apparel, race memorabilia, etc. During the event there are several traditional scramble format contests where the golfers can win additional prizes. - Partial teams are welcome. For example, if you register yourself and one other golfer, we will combine your pair with another pair the day of the event. - The event is capped at 144 golfers. It is first come, first serve. Inquiries regarding participation and sponsorship are welcome in this thread, at the Billy Kimmel Memorial Facebook page listed below, or via email to mechkimmel@comcast.net or call 717-697-5380. The Billy Kimmel Memorial Fund will award the 12th Annual Memorial Scholarship to a student / race fan through local race tracks. Racing was very important to Billy, and we feel that this $3,000 scholarship, given in Billy's memory, will benefit someone with both respect for education, as well as a love of racing. The scholarship will be presented on the front stretch at Williams Grove Speedway during intermission at the 12th Annual Billy Kimmel Memorial Race on Friday, August 2, 2019. Qualifications: Must be enrolled at an accredited college or technical or business school. No specific major is required, but the school must be a 2 or 4-year facility. Applications must be submitted by June 30, 2019 and winner must attend the Billy Kimmel Memorial Race at Williams Grove Speedway on Friday, August 2, 2019. William James Allen Kimmel, 27, of Mechanicsburg, passed away Sunday, September 2nd, as a result of a Sprint Car Accident doing what he loved most. Billy was born in Camp Hill, on September 22, 1979, the son of Robert A. and Jean L. Kimmel who survive him. He was a graduate of Mechanicsburg High School. 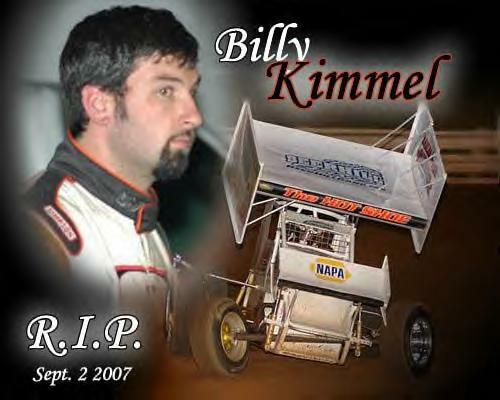 Billy was an avid Sprint Car racer and fan, he worked on various teams since the age of 12, eventually owning his own car and team, racing mostly at Williams Grove Speedway and sometimes Lincoln and Port Royal Speedways. In addition to his parents, he is survived by his brother Robert P. Kimmel of Dillsburg.